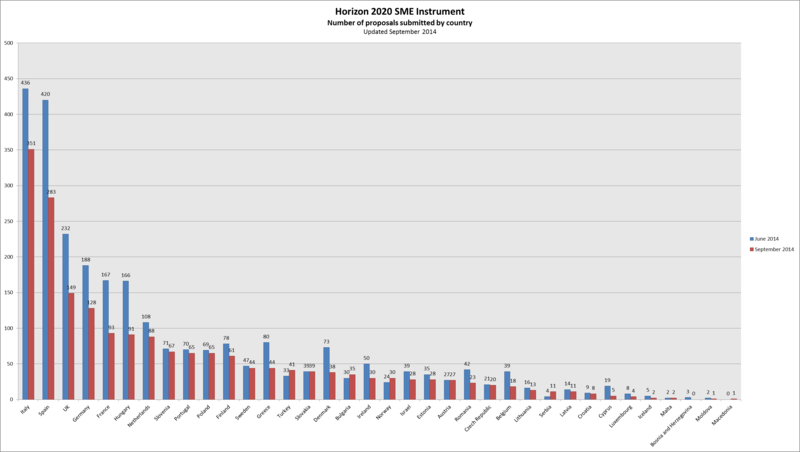 24 September 2014 was the second cut-off date for Horizon 2020’s SME Instrument phase 1 . EASME received 1,944 new proposals, which makes in total more than 4,600 when adding up the applications submitted in June. The ranking by country remains the same as in June, with Italy in the lead in terms of number of applications (351), followed by Spain (283), United Kingdom (149), Germany (128), France (93) and Hungary (91). The Open Disruptive Innovation (ODI) scheme attracted the biggest number of proposals (608), followed by low carbon energy systems (268), nanotechnologies (234) and eco-innovation/raw materials (199). The result of the evaluation should be available towards the end of November 2014. The list of the first 155 beneficiaries of the SME Instrument phase 1 has been published on 18 September. They will receive €50,000 to finance feasibility studies for their projects; they can also benefit from up to three days of business coaching. The next deadline for phase 1 is on 17 December 2014.